One of the issues that made headlines earlier this month is on the National Higher Education Fund Corporation (PTPTN). 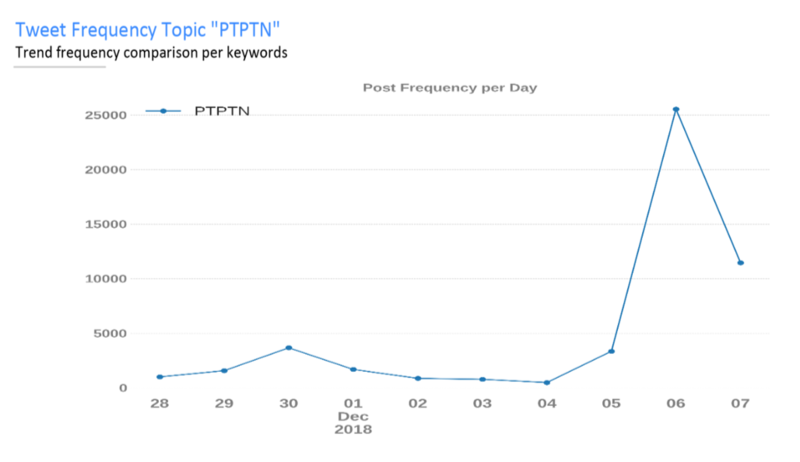 The topic on ‘PTPTN’ start building buzz in the media on the 5th of December 2018 before peaking the next day with more than 25000 tweets. On the 5th of December, PTPTN chairman Wan Saiful Wan Jan announced a monthly salary deduction on PTPTN borrowers earning a minimum wage of RM2,000 and above effective January 1st, 2019. The next day, Minister of Education Maszlee Malik via his Twitter negated Wan by announcing the postponing the repayment of the new scheme only until they have received feedbacks from major stakeholders. As a consequent, this has triggered the publics’ anger. Many criticised the government’s rash decision; suggesting that they should first consult the stakeholders’ and conduct a proper discussion before making any major announcement to the public. In Twitter, most used words on this day are ‘ptptn’, ‘pembayaran’, ‘bayar’ while hashtags are ‘demimahasiswa’ referring to Minister of Youth and Sports Syed Saddiq update of PTPTN repayment will only start when the salary reaches RM2000 (29 November); ‘youthpower’ looks at the voice of the youth in sharing their views on the repayment rate of PTPTN; and ‘ptptn’. Following Wan’s announcement, netizens on Twitter started to vent their frustration on social media. The main influencer in triggering negative responses from the public regarding the new loan repayment scheme is @The_UglyOrgan. The network grew bigger the next day (6 December) whereby more and more people venting their frustration over the new scheme. Twitter user Atikah Nasima @nsma_aj shared a screenshot of an anonymous comment on Facebook who was disappointed with the newly-introduced mechanism that requires them to pay more as opposed to the amount they have been paying according to the previous agreements with the corporation. @nsma_aj tweet garnered 4.0k tweets as of Dec 6. Overall, the network is divided into 3 clusters – purple, orange, green. 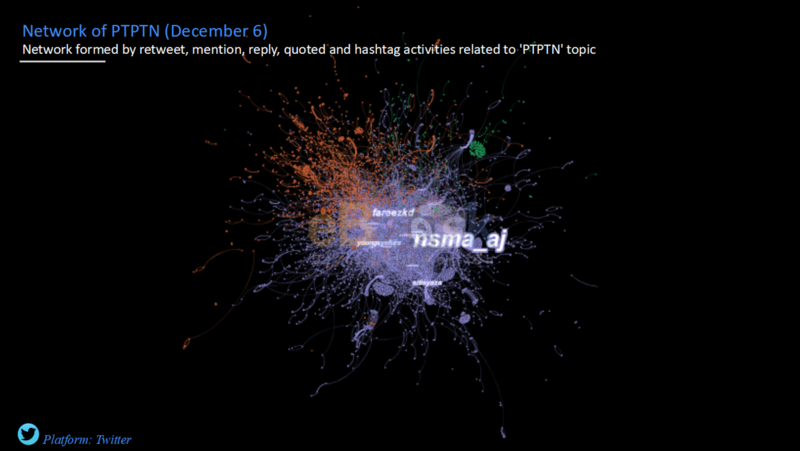 The biggest cluster of the network is the purple cluster with 34.340 tweets. This cluster are those who are against the new PTPTN policy. The main influencer in this cluster is Rembau MP, Khairy Jamaluddin @ Khairykj whom had also called for the implementation of the new scheme to be postponed. Others are @The_UglyOrgan, @EddSkater and @Justhfizrshid. Next is the orange cluster with 9.498 tweets. 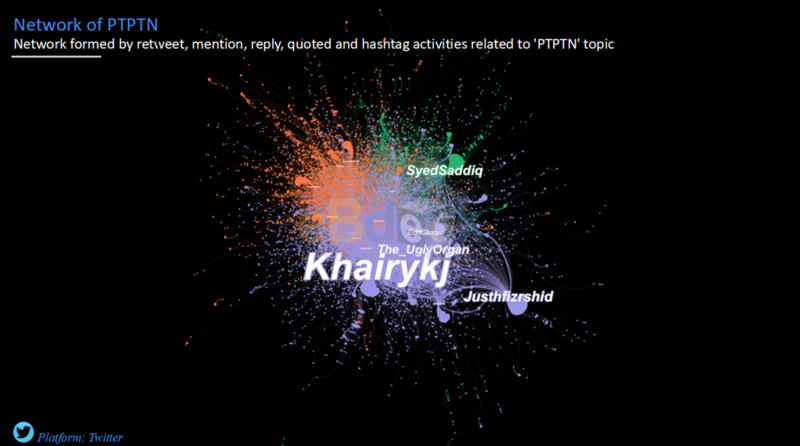 This cluster looks at the media covering on the ‘PTPTN’ issue. Last but not least, the green cluster has 4,179 tweets. The main influencer in this cluster is @syedsaddiq whereby he pledges to defend the voice of the youth in relation to the new loan repayment scheme, saying that there is a need for the scheme to be fair to borrowers who have made their repayments every month. Maszlee announcement on postponing the scheme somewhat shows that this was done without proper discussion and consultation. As the Minister of Education, it is important for Maszlee to oversee all-things related to his scope of expertise, making sure that no announcement is made publicly before it is unanimously agreed to avoid consequences as such.